According to LEDinside Research Manager Joanne Wu, in 2017, the top five UV LED manufacturers were Seoul Viosys, LG Innotek, Nitride Semiconductors, Nichia and Epitop. In 2018, Japanese and Korean manufacturers actively developed UV LED market. The revenue rankings are listed below in sequence: Nitride Semiconductors, Seoul Viosys, LG Innotek, Nichia and Epitop. Currently, the average EQE of UV-C LED is 1-4%. LG Innotek is the leader on the UV-C market, with EQE of 4.33%. Yet, Stanley, DOWA, Nitride Semiconductors and Seoul Viosys continue to increase product efficiency. According to LEDinside, in 2019, there will be more LED manufacturers actively developing UV-C LED products, including Nichia, OSRAM OS, UVphotonics and Violumas. Static water sterilization and surface sterilization (air purification, home appliances, etc.) has low requirement on exposure time, and the demand side adopts UV LED products to achieve added value. The market application is quite wide and there are many emerging markets created, including baby products, mobile phones, escalators, and household products such as toothbrushes, toilets, cupboards, sports water bottle and thermos flasks. Furthermore, flowing Water Sterilization requires fast purifying time. The market has higher requirement in product’s power rate. LEDinisde analyzed household water purification market includes water dispenser, hot & cold water dispensers, whole house water filter system and baby formula maker. As of commercial and industrial market field, the global water treatment market scale is around USD 20 billion and market growth is mainly driven by water scarcity and sustainability of water resources. 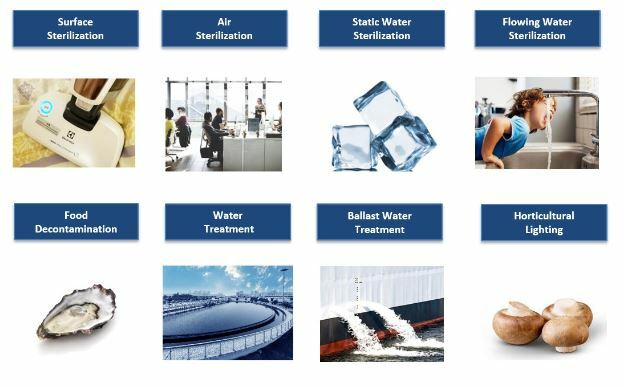 Water treatment application markets cover Aquaculture, Commercial Building, Food Beverage Industry, Pools and Leisure, Life Sciences Pharma & Biopharma, Municipal Water & Waste Water, Oil & Gas. Majorly, there are three methods for water purification and sterilization, including Gravity / Filter Purifier, RO Purifier and UV Purifier. reverse osmosis is the market mainstream, but combining UV purifying method to do disinfection and sterilization, as well as degrade TOC. Water Treatment becomes the most potential market for UV-C LED. In response to water treatment market demand, Japanese and Korean makers aggressively move to high power LED market development to enter flowing water module application. In the future, the UV-C LED market will move toward polarization: some manufacturers will enter the general consumer market, while others will enter the high-end commercial/industrial market. LEDinside focuses on eight major applications and 16-20 products market trend to providing readers with an overall understanding towards the deep UV LED market.